The feedback received from international customers is that a device with a replaceable probe would be advantageous for them. Many of the data loggers on the market of this style have a built in probe and must be returned to the factory for servicing. The down time this causes customers can be weeks to months. By offering a model with a user replaceable probe, customers can keep additional probes on hand to serve as a backup and continue their routine processes. Depending on the measurement range of the attached RTD probe, the HiTemp140-M12 is capable of recording temperatures as high as 850 °C (1562 °F) and as low as -200 °C (-328 °C). The HiTemp140-M12 also inherits the IP rating of the probe it is being used with, making it the ideal data logger for meeting the IP needs of everything from dry heat sterilization to high moisture environments including steam sterilization cycle monitoring, food processes and various environmental studies. Featuring a user programmable recording interval as fast as 4 readings per second, or as slow as one reading every 24 hours, the HiTemp140-M12 is capable of storing up to 43,690 time and date stamped readings. As with all loggers in this series, the HiTemp140-M12 is compatible with an assortment of accessories including the MultiMount-Z, MagMount-1 and the Key Ring End Cap. 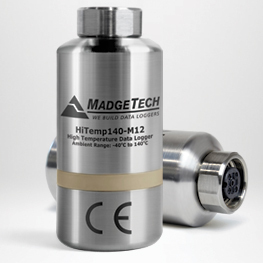 The HiTemp140-M12 has an operating range of -40 °C to 140 °C, but can be used in much higher temperatures when combined with MadgeTech’s thermal barrier options and suitable probe.